I've had a mental to-do list of nail ideas that never came to fruition because I couldn't figure out a nice way to execute them. For one thing, I've been dying to use this sheer red jelly I acquired: Revlon Cherry Fizz. It's labeled as a 'Glimmer Gloss' and I had never heard of this line before. I snagged it by chance for around a dollar at a store closing sale. On top of that, I finally bought Milani Gems, the famed Deborah Lippmann Happy Birthday dupe, and I knew I had to do a jelly sandwich with it. Lastly, I've been itching to try a gingham print but I was always really unsure of whether or not creme finishes could do the job. I now know: jelly finishes are the way to go! So how did this jumble of ideas come together? Last week I saw this adorable manicure by the very talented Katy of Nailed It. (scroll to the bottom of the post, underneath those perfect swatches). I used her design as accent nails and a full gingham print on the rest of the nails. I'm pretty happy with the result, I think it came out really cute :) By the way, about jelly polishes and gingham: This method was so easy, no mixing for darker shades required! The sheer jelly built opacity nicely, simply by adding a dab of polish at the gingham intersections. For the accent nails I started of with a base of OPI Red Lights Ahead... Where? Then I layered a coat of Milani Gems followed by a couple layers of Revlon Cherry Fizz. For the gingham I used OPI Alpine Snow for the base colour. I just used the brush that came with Revlon Cherry Fizz for the gingham. 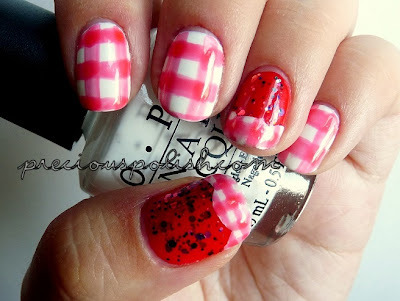 For the gingham tips I did the same thing but outlined the shape with a white striping polish first. This came out great! I remember seeing Nailed It's post haha. I love yours! So cute! I love the jelly sammiches!